Espey Mfg. designed and manufactures this power supply for a prime military contractor supplying helmet mounted cueing systems for tactical aircraft. Espey Mfg. 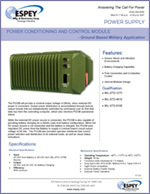 designed and manufactures this power converter for a US Army Ground Based Communications Application. The power converter operates from either 115/230VAC or 28VDC in accordance with MIL-STD-1275, to provide regulated outputs of +/-5, +/-15, -52, +90 VDC with a continuous power rating of 170W. Espey developed this power supply for a major locomotive manufacturer. 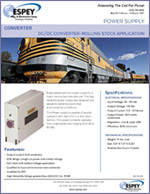 The high reliability power supply was designed and tested for extreme locomotive environmental conditions. 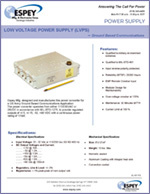 This Power supply is capable of parallel operation with like units in a redundant fashion. 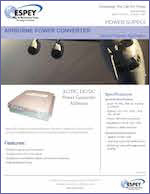 This power Converter operates from a very wide input ranging from 25 to 85 Vdc. The PCCM will provide a nominal output voltage of 28Vdc, when external DC power is connected. Output power distribution is accomplished through branch output circuits that are independently controlled by commands over an EIA-422 data bus from the controlling computer, which also monitors PCCM operational status. While the external DC power source is connected, the PCCM is also capable of providing battery charging for a 24Vdc Lead Acid battery configuration. When the DC power source is not connected and the battery is charged, the PCCM uses regulated DC power from the Battery to supply a nominal branch circuit output voltage of 28 Vdc. The PCCM also provides operator interfaces that control power selection and distribution to its external loads, as well as visual status indications. 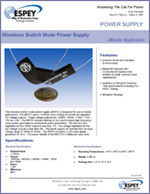 This miniature switchmode power supply (MSPS) is designed for use in missile applications. The MSPS uses a +/-20Vdc input voltage to provide six regulated DC voltage outputs. These voltage outputs are –2500V, +640V, +180V, +15V, - 15V and +5V. The MSPS includes filtering on the input to reject high frequency noise spikes generated by mechanical power generators. The line and load regulation for the +640V output is less than 1%. The voltage regulation for the low voltage outputs is less than 4%. The power supply will operate from an input voltage range of 16Vdc to 35Vdc. The MSPS will reject 1-volt noise spikes generated at 1kHz. The power density of the MSPS is 5 Watts per cubic inch. Espey Mfg. 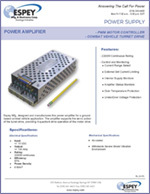 designed and manufactures this power amplifier for a ground based combat vehicle application. The amplifier supports the servo action of the turret drive, providing 4-quadrant drive operation of the motor drive.